Welcome back readers! Here is another entry in our Questions about Class series, this time focusing on the Cavalier. As you may (or may not) know, Flying Pincushion Games is about to released its next book, Into the Breach: The Cavalier. So we thought it was a good time that I, Kiel Howell, sit down with fellow Pincushioneer Jeffery Harris to talk about the class. KH: First of all, thank you for taking the time to sit down and answer these questions! JH: My pleasure Kiel, thank you for taking the time to lay down some excellent questions about the cavalier class! KH: Can you give the readers a little about yourself and your role at The Flying Pincushion? JH: Well sure, I am of course Jeff Harris, co-owner, CFO, sometimes editor and lead designer here at The Flying Pincushion. I have been gaming for more than 24 years, but have only been in the industry officially for about two and a half years. I am married to a lovely wife and live in a house with as many cats as there are core classes. KH: So what exactly is a cavalier? Isn’t it just a Paladin on a horse? Minus the curatives? JH: For those who are not aware, the word cavalier in our real world actually means: Cavalier (/ˌkævəˈlɪər/) was the name used by Parliamentarians for a supporter of King Charles I and his son Charles II during the English Civil War, the Interregnum, and the Restoration (1642 – c. 1679). Cavaliers were also known as Royalists. But for our discussion purposes here, the cavalier is much more than just a magicless paladin with looser ethics. To me a cavalier in Pathfinder is something of the quintessential hero, or villain. 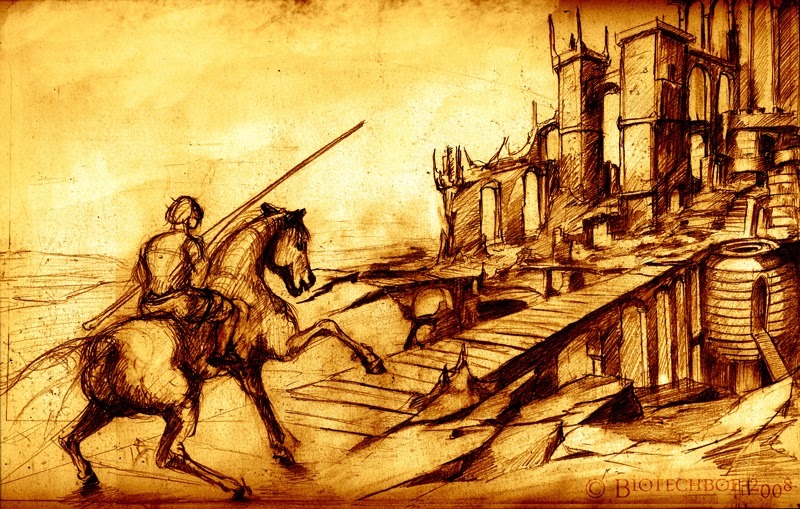 Charging, challenging, holding the front line, or bolstering allies with tactics, are all things that great heroes and villains do in fantasy literature, and the cavalier does on the battle matt. While paladins gain power from divine sources, a cavalier draws inspiration and power from dedicating themselves to an ideal, except that ideal need not be honorable or goodly. In short cavaliers gain their power by belief in the tenants of their Order. KH: Why does this stand as a whole class to you? Would it have been better as an archetype of the Fighter? KH: What is a class that is so dependant on a mount supposed to do when they can’t have their mount? JH: That is a great question Kiel, as just such an issue often arises for those playing a cavalier in dungeon or narrow terrain heavy games. The Flying Pincushion deals with this issue in the forthcoming Into the Breach: the Cavalier by providing cavalier archetypes that trade out or alter the mount class feature. For instance one of our new archetypes trades your mount for an animal companion that you cannot ride, but who makes an excellent combat partner, while another trades your normal horse for a ghostly one, which narrow walls bother not a bit. However, that answer does not address all of the cavaliers who have a large sized horse or mount, but really want to get into that narrow dungeon. I suspect this is where clever thinking or a little help from your parties wizard comes in handy here. A quick casting of carry companion or similar magic can help keep your mount with the party. Also small sized cavaliers on medium sized mounts are not only interesting to play, but work just fine in most dungeons, I highly recommend trying one out, I happen to know from personal game experience that they can be very fun. KH: Can you explain Cavalier Orders a bit? JH: The best way to think of a cavalier Order is as an ethical or moral stance from which all cavaliers of that order work. They may do things a little differently from person to person, but their strong belief in the tenants of their order make cavaliers what they are and influence how the character interacts with the game world. KH: This class seems to suffer from what I’ll call GM arbitration issues. As in, judging when a cavalier character is keeping to his Order’s edicts. Yet there are no rules for “fallen” cavaliers. What do you think? JH: On one side, this open area is role play opportunity and wiggle room for the player, but for GM’s it boils down to a judgement call. If I were GMing a player whose cavalier has very clearly and often violated their Orders edicts, I would have that player lose their Order abilities until he or she undertook making reparations or returns to following more closely the edicts of their Order. Falling further out of line with ones edicts could well also cause an alignment change or invoke the wrath of that Order, again, it falls to the GM to deal with such an issue as they deem appropriate. However it does pay to remember that cavaliers are not paladins, and as such likely do not need a “fallen” template. Also, if a player cannot or does not follow the edicts of their current Order, the GM and player may well just want to sit down and perhaps find an Order whose edicts are more in line with the players style. This is a spot where communication is likely key to keeping the game fun for all while keeping with the spirit of the cavalier’s Orders. JH: At first glance, that looks very true, as on the surface the cavalier seems very much a “challenge BBEG, charge BBEG. However, not only have we attempted to broaden the horizons of the cavalier class with our offerings in Into the Breach: the Cavalier by reimagining what the scope of a cavalier is, but just like any other class, how you build and play it define it. Sure you can just go with the change on a mount basic build and optimize that all day, but taking time to really imagine a unique and personal take on the cavalier is likely more satisfying. Being size Small opens up quite a few interesting options, as does experimenting with styles that may not be perfect, but that are interesting and flavorful. As with any class, a cavalier is only what you make of it. KH: Should the Cavalier get some sort of Weapon Training ala the Fighter? JH: From a strict balance perspective, I would say no, simply because there is a plethora of feats, traits, and other options that are just as good as Weapon Training that the cavalier can already obtain. From the theme perspective the cavalier is more than just a fighter on a horse, he can be a general, an outrider, a robber knight, and much more, all just by using the features that class already has. The answer is not always giving a class something more, it is making what they already have go further. KH: Challenges are interesting enough, but they seem limited in both number of uses and number of creatures affected. Your thoughts on the mechanic? JH: I cannot speak for the Paizo design staff, but the limits to challenge make sense to me. In keeping with the flavor of the cavalier, challenge is likely very much limited in target scope to further play up the heroic and brave/egotistical and brash aspects of a cavalier. Challenging the BBEG or BLGG (big lawful good guy) and going at him one on one, is cavalier in the extreme (as in, having a cavalier attitude). Limiting the number of challenges a cavalier gets per day, just like limited spells, or limited channel bursts, is just that, a balance factor, as in the end, Pathfinder is still a game that needs balance to its rules in order to function, and here we see just that. JH: Here again the choice of making the cavalier a full BAB class is a balance choice in my opinion. Fiction tells tales of one great charge, hundreds of horses hooves churning the ground and their riders in gleaming plate lowering lances in unison to devastate a massed foe on foot. However fiction does not have a complex system of rules, which must balance out against each other. As a martial class the cavalier falls in line with all other martial classes, which means a full BAB. Sometimes reality needs to be ignored in order to retain balance. KH: What would you change about the base class if you were given free reign? JH: I would expand the available mount options for cavaliers, especially for Small sized characters. However as it sits, cavalier is near the top of my list for favorite martial class to play. KH: Have you ever had to ban or have you seen the class banned at a table? JH: At least from personal experience I have never had an issue with a cavalier character at my table, and have not seen any sort of article alluding to there being a ban. That is not to say it has not happened, but as a martial character, the cavalier lacks many of the “game breaker” factors of certain other classes that will remain nameless. The GM may feel differently when a cavalier impales his four hours worth of work BBEG with a lance using Spirited Charge, but generally that just means you doing something right. KH: What is your advice for building a successful Cavalier? JH: The best advice I can give is be flexible, build smart, and pick a few things you want your cavalier to do well, and build towards those. The cavalier has plenty of class features that work fine when not mounted, and there are plenty of ways to work with or around the limiting factor of mount size and dungeon/tight space areas. While mounted charging does lots of damage, I urge people to explore and play with the other features of the class, like Tactician and challenge. And of course, if you want new and interesting options for the cavalier, pick up a copy of Into the Breach: the Cavalier, as it has lots of new twists and takes on the vanella jump on a horse with a big sharp stick cavalier. Cavalier is an attitude along with a class, and the The Flying Pincushion writers have really put some ‘tude into their work on the Cavalier. KH: Thank you for taking the time to have this chat, Jeff! JH: Not a problem, as it has been an honor to respond to your insightful and interesting set of Questions about Class this time around. And I hope this discussion helps folk better understand a great class and that its just not for horse fans anymore. If you like playing a martial character with a reason for being that has nothing to do with gods and lots of attitude, the cavalier is most definitely for you.